It’s said that timing is everything, and it’s so true when picking a time to visit a destination. Mexico has many festivals throughout the year, but one such is the combination of the Puerto Vallarta’s LGTB May Pride Celebration as it coincides with their Restaurant week, providing many opportunities for both exceptional fun and food. Puerto Vallarta has long been a friendly environment for the LGTB community and the community coming together to host their fourth annual May Pride Week in 2016 is such an example. Parties and receptions held in and around the town offers the visitor a chance to see venues, they might not know exists. There is a structured bar crawl (http://gayvallartabarhopping.com) where first time Puerto Vallarta visitors can easily partake of the festivities with a guide, and be in the right venue for special events. The high mountain lodge at Villa Savana (www.villasavana.com) supplies a panoramic view of the town and beach, and quaint views of the houses of local citizens. The white washed accommodation, offers an historic character to the complex of pool and vista filled terrace. At such a reception you might be treated to the guitar stylings of Eduardo Leon, and take home his CD for remembering the intoxicating experience again and again. An upscale and visually stunning restaurant is the Café de Artistes (www.cafedesartistes.com) There you can have a Chilean wine with a smoked “Mahi Mahi”, a delicate roasted sea bass filet over a confit turnip perfumed with anise, spinach and fine herb sauce, the best Short Rib and Beef Petals duo with creamy chipolte chili sauce and topped off with a desert of “guanaban” sorbet and fried “bunuelos”. All were presented artistically and at times the visual presentation out shinned the taste. A family owned and indigenous restaurant is the humble and quaint, El Arrayan (http://elarrayan.com.mx/en/) located in the middle of old town. Here the walls are filled with displays of ingenious art presiding over a table of authentic local tastes. 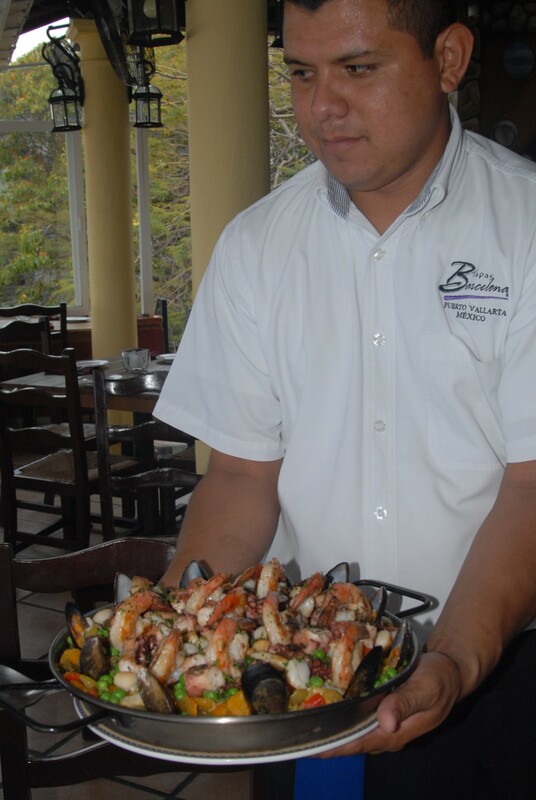 In operation for fifteen years, the Banderas Tapas (http://barcelonatapas.net/) offers a variety of small dishes fusing traditional tastes with other cultures accompanying wonderful sunset views. A tasting menu is available. The amendable bar tender can prepare exotic cocktails or fill your own personal Martini requests. 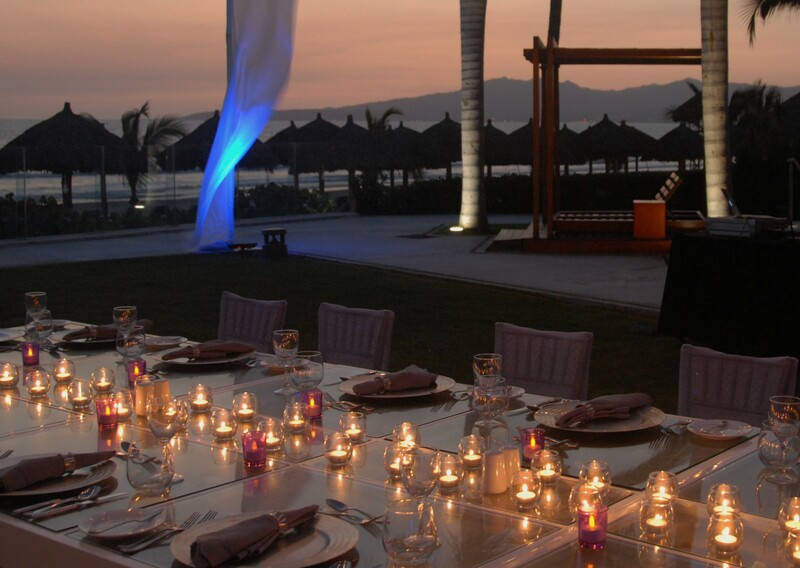 With gourmet food in an open air vista filled venue and attentive service, who could ask for more? A true delight is the food and ambiance of the ocean side setting of the Sapphire Beach Club (http://sapphire.mx ), which also hosts accommodations and a fresh water pool, overlooking the palapas of the beach, complete with roaming sellers of local goods. Your brunch at the Villa Mercedes (www.hotelvillamercedes.com ) might find a buffet of delights, by a pool and shaded lounge area, adjacent to a more formal restaurant and bar. You might relax here, or stay at this boutique hotel, before venturing over to the nearby Mantamar Beach Club (http://en.mantamarvallarta.com/. 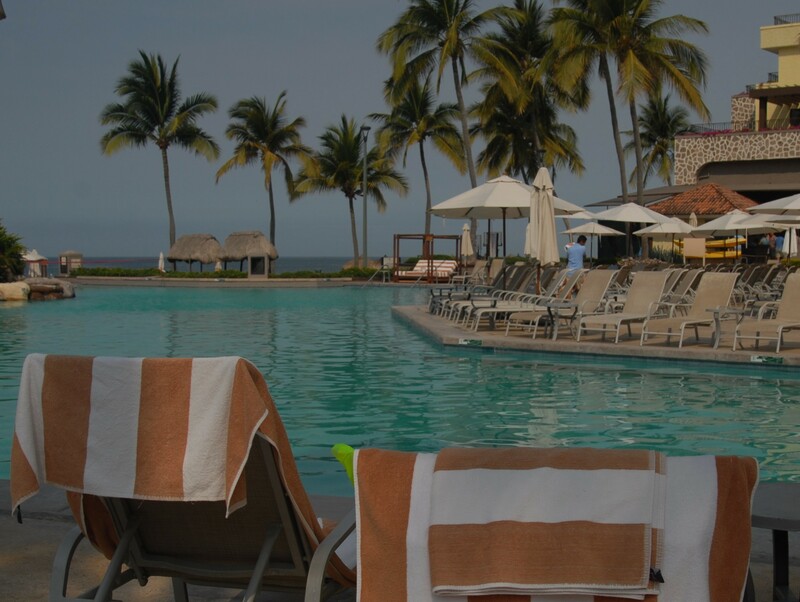 They supply food, drink, entertainment, and an expansive pool with cabanas, changing rooms and an upstairs area for viewing the pool and the expansive Puerto Vallarta Beach. You can spend an entire day there soaking up the festival culture with locals and out of town party goers. For all of the above dining venues be sure to make arrangements before arriving to double check their availability. Your home base might be the modern Casa Magna Marriott (http://www.marriott.com/hotels/travel/pvrmx-casamagna-marriott-puerto-vallarta-resort-and-spa/) in the hotel zone away from the historic downtown, or stay a short distance away at the all-inclusive Hard Rock Hotel Vallarta (http://www.hrhvallarta.com/) Enjoy the VIP section of the beach with wait staff and a special VIP menu, or stroll around the pool areas with cocktail in hand, or relax in the shade, or take in the offerings of their Spa, with salon treatments or a massage, and don’t forget to sample several of their restaurants. 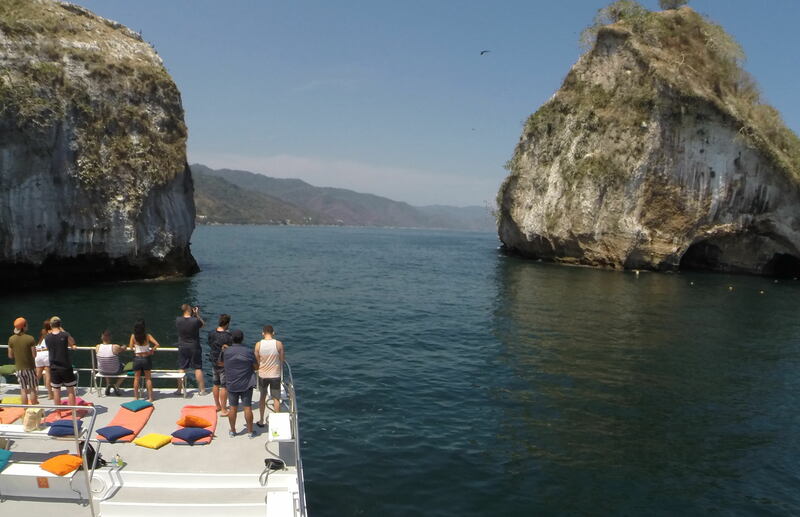 Despite all the shopping and dining opportunities in Puerto Vallarta proper, it’s easy to recommend a coastal sail along Banderas Bay with Mike’s fishing and charter tours ( http://pvmikesfishing.com/ , where with party music and refreshments gives you a chance to feel as if you are on a private yacht. This get a way sail, to a coast beach near of the Marietta’s Islands is where you might enjoy snorkeling. This relaxing day experience is not to be overlooked. Don’t forget your sunscreen! Any time is a good time to experience the safe and tourist friendly resort town of Puerto Vallarta. 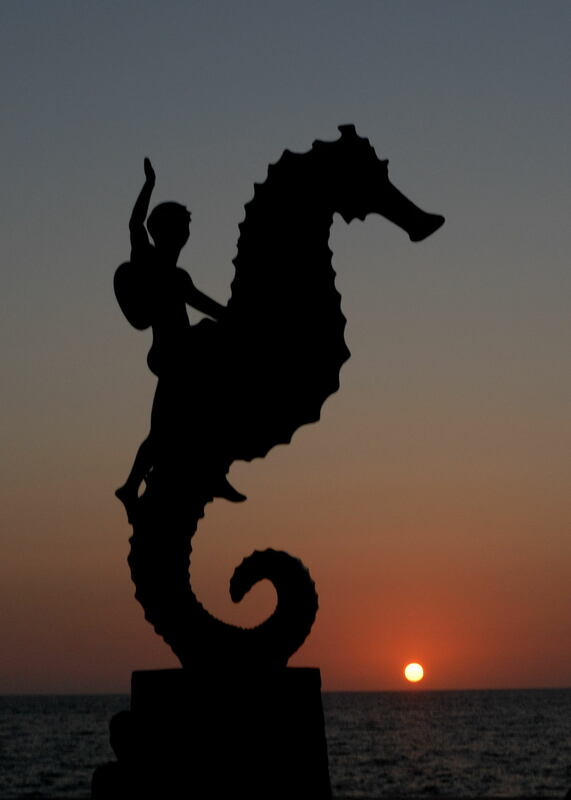 A sunset stroll along the popular malecon with its iconic Puerto Vallarta Sea horse sculpture is a must. More information can be obtained at: www.visitpuertovallarta.com.